Coca-Cola is adding coffee to its lineup. 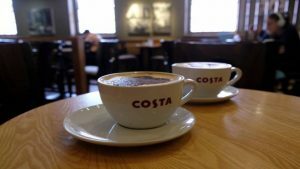 The soft-drinks and water giant agreed to acquire Costa Coffee the coffee chain from Whitbread the hotel and drinks group for a price of £3.9 billion equal to $5.1 billion. Costa has close to 4,000 stores in 32 countries and will give Coca-Cola a strong platform of coffee across areas of Europe, Asia, Africa, and the Middle East, with an opportunity for more expansion, said Coca-Cola in a prepared statement. As well as its retail stores, Costa Coffee has smaller outlets for those on-the-go known as Costa Express, its own roaster and for-home products. Costa was acquired by Whitbread in 1995. Whitbread said it would use its proceeds from the Costa sale to expand the other large brand it has, Premier Inn Hotels. This deal will need the approval of regulators and shareholders, and both parties believe it will be completed by the first six months of 2019. The acquisition of Costa by Coke will put the drinks maker in direct competition with coffee house giant Starbucks, as well as several other large worldwide coffee brands. Earlier in the year, Nestle and Starbucks entered into a global coffee alliance worth $7.2 billion. The alliance will have Nestle market, sell as well as distribute products from Starbucks outside its stores. JAB, a holding company based in Luxembourg that owns Peet’s Coffee and Krispy Kreme, acquired UK coffee and sandwich chain Pret A Manger last May. Another JAB coffee brand, Keurig merged in January with one of the domestic competitors of Coca-Cola, Dr Pepper Snapple. CEO of Coca-Cola James Quincy on Friday said that hot beverages are one segment of the overall beverage landscape where Coca-Cola is lacking a global brand. Quincy added that Costa gives the company access to that market with a very strong coffee platform. In other sectors the competition is becoming more intense. Coca-Cola’s biggest rival PepsiCo announced in early August that it would acquire SodaStream, the do-it-yourself seltzer company based in Israel for $3.2 billion. The sales figure for the deal of $5.1 billion represents a multiple of 16 times the expected earnings at Costa for all of 2018. The move by Coca-Cola into the coffee market is a trend that’s growing amongst makers of soft-drinks, as they attempt to find other ways of increasing revenue as consumers shift from fizzy, sugary drinks to others.